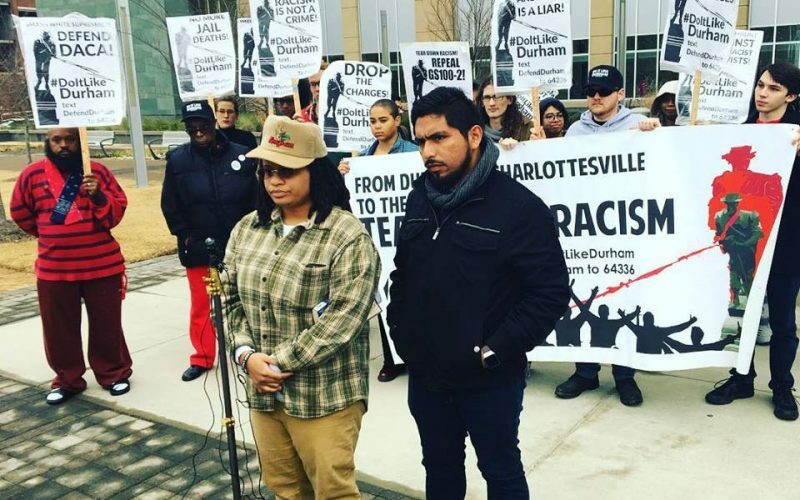 Durham, NC – The struggle against white supremacy and state repression scored a major victory on Thursday, January 11, in Durham. All felony charges against eight anti-racist activists in connection with the Confederate monument toppling on August 14, 2017 were dropped at their latest court appearance. A trial date was set for February 19. The eight now face three misdemeanor charges: defacing a public building or monument, conspiracy to deface a public building or monument, and injury to real property. The People’s Tribunal will convene on Saturday, January 13, from 2 to 5pm at CityWell Church (2317 Chapel Hill Road, Durham). The church has been offering sanctuary to Samuel Oliver-Bruno, a Mexican immigrant who is fighting a deportation order, since December. The Tribunal will charge city, state, and national official with the following crimes against the people: 1) Conspiracy and Obstruction of Justice to protect and uphold white supremacy; 2) Collusion with special interests to profit off the misery of communities of color as well as poor and working-class people; 3) Negligent and Serial Homicide: In public jails and detention centers; 4) Real Crimes Against the People: Racism, homelessness, choosing profit over people.